If you live in the West Vancouver area, chances are that you’ve put a lot of time, money and effort into your property. It is not nice to have someone come by and slap an unwanted coat of paint across it, but it is a reality. 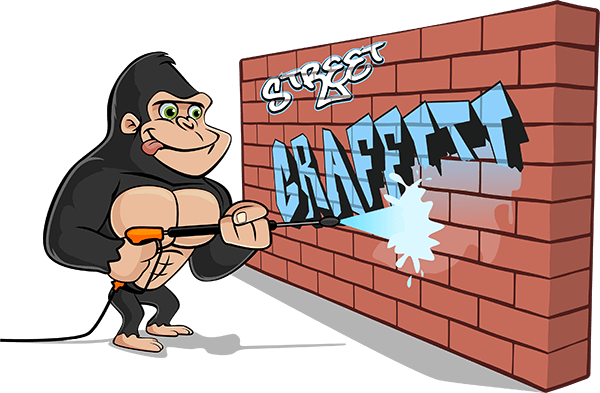 Every day, our Gorillas are called out for our West Vancouver graffiti removal service. Luckily for residents, our technicians love to be busy. For anyone who has been hit by graffiti or even seen it around, it is clear that it is a messy medium. Aerosol paints do not go on in easy strokes like other types of paint. Spray paints come out of the can in a cone shape, creating a lot of overspray around the central design. This paint can look a lot like a shadow, surrounding the main spray. It is not surprising that every graffiti artist is not the next Monet or Picasso. In the same way there are amateurs and veterans in every occupation – street artists are the same. Although some veteran graffiti artists can create works of art, amateurs are still learning to control their medium. This inexperience can lead to bleeding, when paint becomes heavy and drips down the side of their canvas – otherwise known as your walls! Instead of one designated stain, having your property “tagged” can make one huge mess! There is no shortage of heritage buildings throughout the West Vancouver region. When these properties are struck by vandalism, it can mean big trouble! Trying to tackle graffiti on this stage can damage the outer materials of your property. Our Gorillas are taught how to manage even the most delicate exterior materials. Eco-Friendly cleaning solutions are gentle, efficient and non-destructive to your property.